Capture the flavors of spring in this easy, one-pan meal. Fresh salmon is topped with a savory herb butter, and baked with crisp asparagus for a dish that's so delicious, you won't believe how simple it is. Baking the fish with thinly sliced lemon infuses it with flavor and acidity while cooking, for a super fresh tasting dish. Wrapping the fish and asparagus in a foil packet while baking also helps steam them—for healthier prep and easy clean-up! If you like, double the herb butter and save the rest to spread on fresh baguette slices or sandwiches. You can easily make this dinner Whole 30 or paleo friendly. 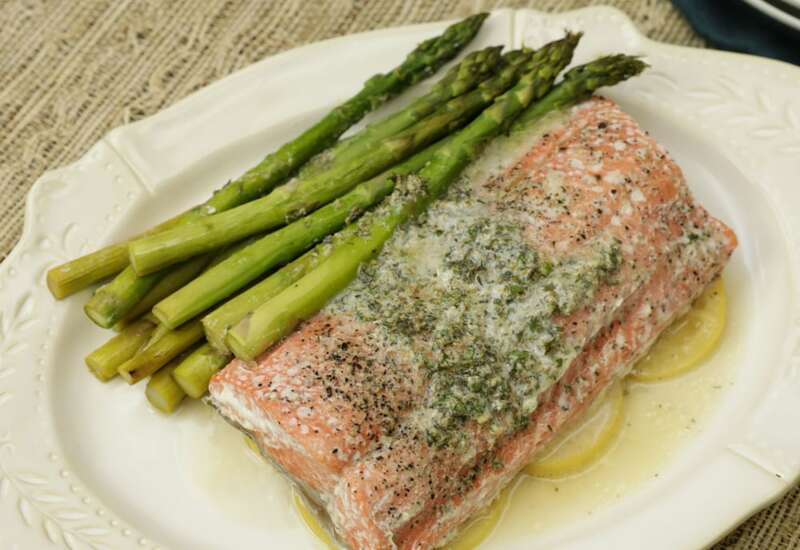 For a dairy-free dish, drizzle olive oil and chopped fresh herbs over the salmon and asparagus instead of using softened butter. Use wild-caught Alaskan salmon instead of farmed for the most flavor. Per Serving: 473 calories; 37g fat; 7.6g carbohydrates; 28g protein; 133mg cholesterol; 1149mg sodium. Really good salmon! I love foil packet dinners, and this recipe is one of the reasons why. This is a super easy, simple recipe for even beginner cooks. The parsley and time add delicious, herb flavors that really complement the fish. This was superb! Salmon and asparagus go together like peanut butter and jelly. It's just a winning combination! I absolutely love this sheet pan recipe because of the fresh thyme, parsley, and fennel. These simple herbs truly take the flavors in this dish to the next level. My husband and I were very satisfied with the way it turned out, it's the perfect dinner for two. Perfect size portions for two people. We did broccoli instead of asparagus, it's one of my favorite recipes! I thought 20 minutes was too long to cook this fish, but other than adjusting the cooking time a little, I think this turned out pretty good. Salmon and asparagus go together like PBJ, it just works. I followed this recipe but put the salmon and asparagus on the grill. I also used the thick asparagus spears instead of the small ones, since I grilled them. So yummy!